This new book offers a timely and lively appraisal of the concept of communicative repertoires, resources we use to express who we are when in dialogue with others. 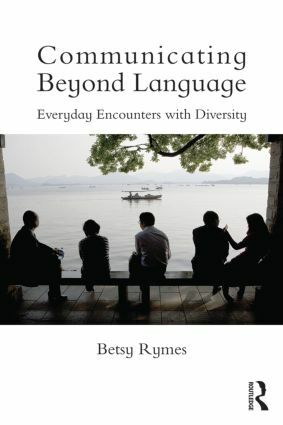 Each chapter describes and illustrates the communicative resources humans deploy daily, but rarely think about – not only the multiple languages we use, but how we dress or gesture, how we greet each other or tell stories, the nicknames we coin, and the mass media references we make – and how these resources combine in infinitely varied performances of identity. Rymes also discusses how our repertoires shift and grow over the course of a lifetime, as well how a repertoire perspective can lead to a rethinking of cultural diversity and human interaction, from categorizing people’s differences to understanding how our repertoires can expand and overlap with other, thereby helping us to find common ground and communicate in increasingly multicultural schools, workplaces, markets, and social spheres. Rymes affirms the importance of the communicative repertoires concept with highly engaging discussions and contemporary examples from mass media, popular culture, and everyday life. The result is a fresh and exciting work that will resonate with students and scholars in sociolinguistics, intercultural communication, applied linguistics, and education.